A couple of days ago, I was out with my friends for coffee. The ambiance was great and we set off chatting up about everything and anything. The waiter came up to take our order. While some of us ordered our lot soon, there were still confusions among some of us as to which was the better option on the menu. The waiter coolly listened to what each person was trying to order. After a minute, he took the liberty of explaining the differences between each drink and even suggested to the guys what they might like based on their preferences. Wasn’t he an epitome of what a good marketer should be? Instead of trying to sell the most expensive item on the menu, he took the time to hear out each individual customer’s preference and then stitched the suggestions based on them. In fact, even after the order was taken, he was free in interacting with us. Yes, you could say it was all for a hefty tip, but I sure can argue that wasn’t the sole focus of it. He was a good listener and hence a good analyst of what the customer needed. THAT, to me is a good marketer. I had specifically said I needed extra cream on my Mocha and another one of my pals requested his Frappe to have extra crumbs. When we received our orders, they were bang on to what we wanted. A lot can be learnt by a marketer from a waiter. The listening was done right, the market study (customer requirement) was perfect, the suggestions were bang on, the information passed to the production team (the Barista) was clear and the end product (coffee) was exactly how the customer wanted it to be. A perfect and successful strategy if I didn’t know better. 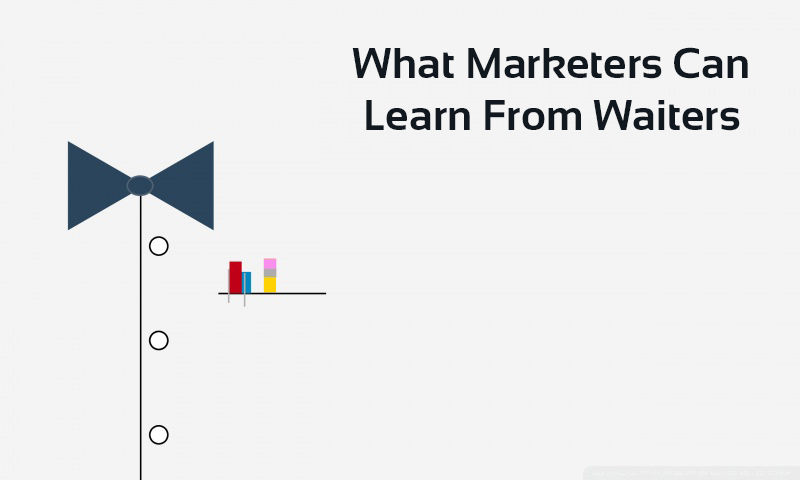 Marketers need to understand that what they do is not Rocket Science. Like everything else, they just need to get their basics right. Once that’s done, the tip will always be pretty hefty! We F&Bians (For the laymen, Food & Beverage Guys) in the Hospitality Industry were taught and trained by our teachers and trainers to “Upsell” the products that we sell in Hotels, Resorts, Restaurants, Coffee Shops, Banquets, Airlines, wherever we worked. That is, even if the customer wants it or not, we push the customer to buy a high priced item to increase our revenue and APC (Average Per Check/Bill). Then came competition and recession and new generation F&Bians. We paid more emphasis on a Happy Customer with a WOW experience and hence changed “Upselling” to “Suggestive Selling”. A Happy Customer may sometimes spend less but will come back again and again, may bring groups and thus volume business and will always give us the cheapest mode of advertising – by the word of mouth. Word of Mouth is the cheapest and the most powerful mode of advertisement. At the end of the day we have a Happy and loyal customer which is what we need!